Shortly after Dominic Adesanya, a 23-year-old man from Maryland, leapt over security fences and began to dash toward the White House on Wednesday evening, he was met by two of the Secret Service's furriest colleagues - K9 officers Hurricane and Jordan, who hurried in to stop his advance. Despite being kicked and punched in the ensuing struggle, the two animals were able to subdue Adesanya for the Secret Service to make the arrest. When Service spokesman Edwin Donovan announced that the threat had been neutralized, he gave credit where credit was due: "The dogs got him." 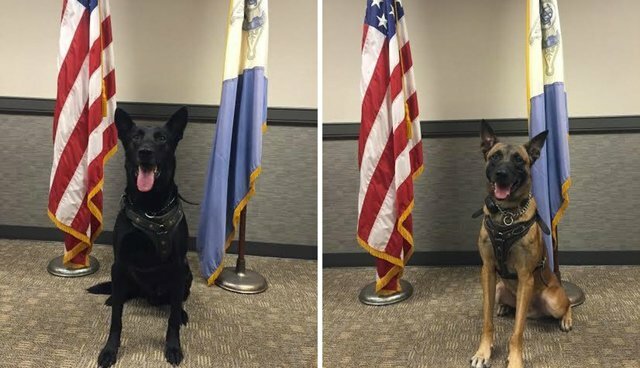 Hurricane and Jordan were taken to a veterinarian to be treated for minor injuries, but are said to be doing well and have been "cleared for duty" to get back to work. Adesanya is now in custody with the U.S. Marshall Service, facing multiple charges for making threats, unlawful entry and resisting arrest - as well as two felony counts for his assault on Hurricane and Jordan. Under the Federal Law Enforcement Animal Protection Act, passed in 2000, inflicting injury on a law enforcement animal is treated as seriously as it would be had the officer been human, resulting in up to ten years in prison for each count. "This person didn't just illegally enter White House grounds - he attempted to seriously injure two law enforcement animals doing their duty. We support his prosecution under the Federal Law Enforcement Animal Protection Act, and hope that a conviction and prison sentence deters other would-be criminals from hurting dogs or horses doing their work to protect our country." According to the Officer Down Memorial Page, 20 police K9s have been killed in the line of duty so far in 2014, with thousands more serving bravely in the face of danger alongside law enforcement officers each and every day.